This is a "one-of-a-kind" belt. The tan leather is a semi-stiff cowhide with a streaked grain and the edges are rolled with a tan ostrich print pigskin. 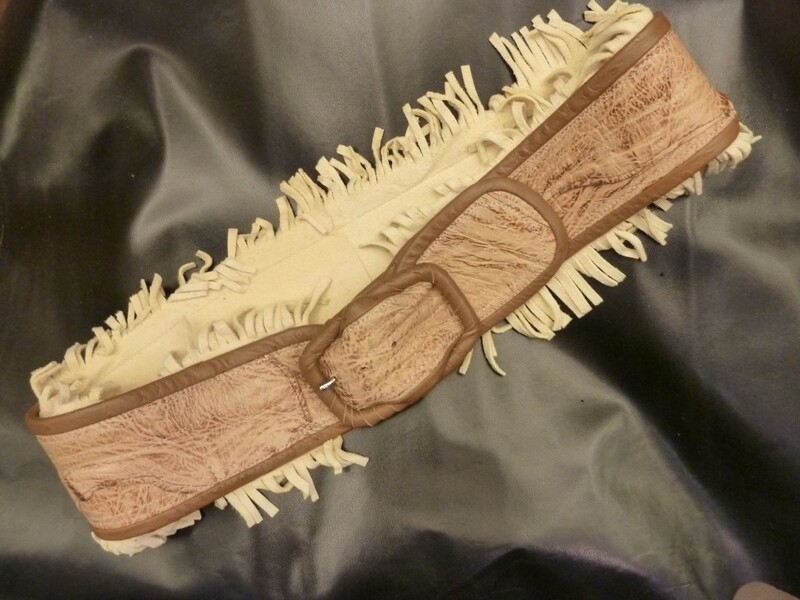 The backing and fringe are a soft chamoise in the classic chamoise color of pale yellow/creme. The buckle is strip-wrapped with the same tan ostrich print leather and the 3" wide belt narrows and crunches down to fit in the buckle. The size is 35-37" but can be shortened by request. This item price has been reduced because it is the only one! We also have a small handbag on sale that matches this belt, please inquire if interested.